Award your child a Special Summer Camp experience! 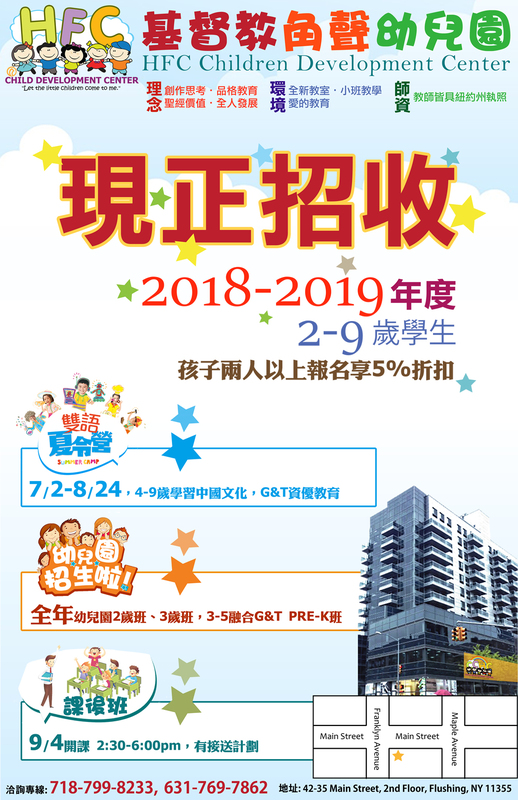 In addition to providing unique courses for children to learn Mandarin, Chinese Music, painting, dancing and proper mannerism, we’ll add on a special learning component to enhance the children’s cognitive and comprehension qualities to cultivate their gifted potential. We focus on building the child’s healthy physical and emotional characteristics. Your child will learn through playing group games to develop teamwork and friendship with other children, as wells as experience God’s amazing love. All classes will be conducted bilingually. We’ll strive to forge a fun, educational, exquisite and active summer camp for your family! HFC Afterschool provides a safe environment, professional homework help, and lively Bible lessons. We hire certified teachers with specializations in beginner reading, phonics, and mathematics. Afterschool focuses on children’s creativity, develop teamwork and friendship. We strive to forge a fun, and educational and active afterschool. Please contact 718-799-8233 for more details. Copyright ©2019 基督教角聲佈道團 All Rights Reserved.